A bit late on the update here - I just get either too busy, too over-whelmed with ideas and photos, or I just don't feel like doing any blogging. The ideas are there but the desire isn't. I bought a cool app for my laptop, to make photo collages. It's a big help for me to utilize my photos in a more concise manner. A photo collage like this one can take care of multiple uploads and make for a pretty photo essay. We had a house full of people for Easter dinner this year. Liz's mom; our friend Roberta and her 1 year old girl; our good friends from church, the Meloy's, Mike, Lise, and one of their three daughters, Meghan. Friends and opera associates, Rob, Christine and their 2 year old daughter, Sophia (one of Nate's special girlfriends!) 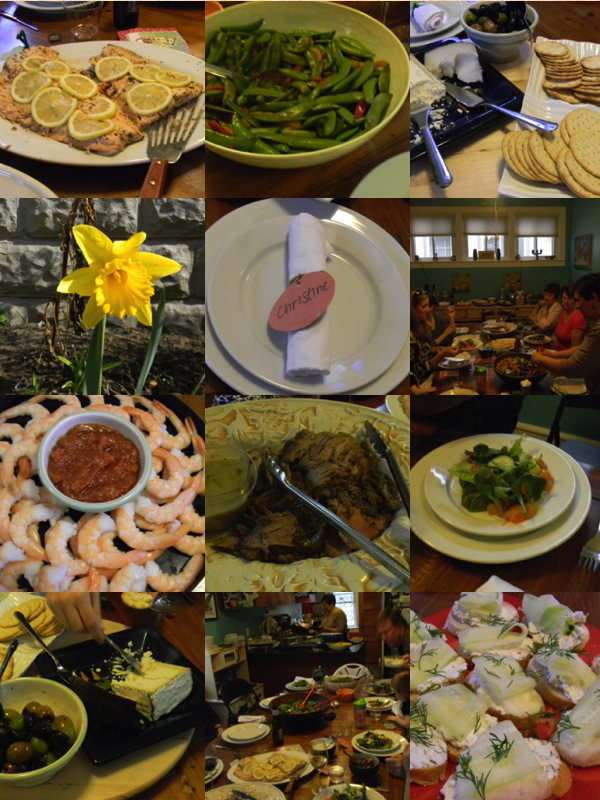 It was a lively bunch and the food, as usual was delicious. We shared dinner and drink responsibilities. Christine brought home-made Boursin spread onto baguette slices and topped with thinly sliced cucumbers. Lise made an amazing "Pascal Lamb", succulent with fat and tinged with rosemary, garlic and onions. I made a poached salmon, served cold, with cucumber yogurt sauce. A simple cheese sampler of goat cheeses - chevere, drunken goat and an aged Humbolt Fog. Roasted asparagus - tis the season after all! Sautéed snap peas with peppers. Olives, and a huge salad, served in an old HUGE wooden bowl that I got from my friend Sue Saidel's family. A bowl big enough in which to bathe a small child! Dessert was strawberry rhubarb and apple pies from Springdale Farms, Easter candies and chocolate chip with orange essence cookies that Lise baked. We ate, drank, laughed and had a lovely time together. The kids played and we reminisced about holidays we've spent together in the past. It's a lot of work, even when you share the cooking. But it's worth it. To make happy memories takes work and love, and I have more than enough to spare and share! Look at all that LOVE! What a wonderful way to spend the holiday! It was a wonderful.afternoon! great food, great company and the most relaxing Easter we've had in many years (we've either been in Europe or in Path Valley) so thank you so much for including us!